If you enjoyed “Ralph Breaks the Internet," you'll want to be sure to check out the virtual reality experience "Ralph Breaks VR" now open at VOID Experience Centers at both Downtown Disney at Disneyland Resort and Disney Springs at Walt Disney World. 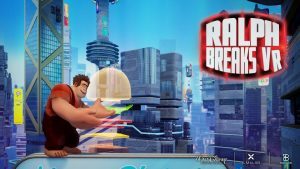 Buy Tickets Now for Ralph Breaks VR – Virtual Reality Experience! Tickets are available now for Ralph Breaks VR, a new virtual reality experience available at The Void. Ever since the virtual reality experience Star Wars: Secrets of the Empire opened last December at Disney Springs, I’ve been wanting to give it a try. I finally had my chance last week, and am I sorry I waited so long! To say it was amazing is an understatement. I found myself at Disney Springs … Continue reading "Entering The VOID – Star Wars: Secrets of the Empire"
Beginning this fall, Ralph Breaks VR, a multi-sensory, hyper-reality experience based on the upcoming Walt Disney Animation Studios film "Ralph Breaks the Internet," will debut. The new experience will immerse participants in the worlds of the internet and online gaming with Wreck-It Ralph and Vanellope, characters from the film. In addition, The VOID and ILMxLAB have announced that they also will collaborate with Marvel Studios on an untitled Marvel experience coming in 2019. Three other original Disney hyper-reality experiences will follow, in collaboration with Walt Disney Animation Studios.